New ultrasound technology that allows welds to be inspected as they’re being produced may be the answer to costly and inefficient traditional inspection techniques. The January issue of the Welding Journal has a case study on the new technology’s performance at Chrysler’s Windsor Assembly Plant. Resistance spot welding involves merging sheets of metal at specific points by applying heat and pressure. The heat is generated by an electric current traveling between electrodes placed on either side of the metal sheets. As the current passes through the sheets, it encounters resistance in the material and the metals begin to heat. Coupling this heat with the application of pressure causes the metals fuse into a single piece. 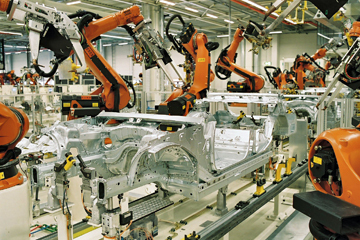 Resistance spot welding is the primary joining technology in the sheet metal industry, especially when it comes to automotive manufacturing; the average car contains 3-4 thousand spot welds that are essential to structural integrity. Traditional means of inspecting these welds involve destroying a random sample of finished pieces in order to determine the quality of the production batch as a whole. This process is costly, not only because of the potential loss of quality products to destructive testing means, but also because production must be halted during inspection and could result in the loss of an entire batch of finished products if the test welds prove faulty. The new ultrasound inspection method uses sound waves to form a real-time image of a weld as it is being created. This eliminates the need to halt production or destroy a weld, and dramatically increases the number of welds that are actually tested. 1. A device called a “piezoelectric transducer” is installed in the cooling water stream inside the electrode used for welding. The transducer is essentially a transmitter/receiver for the sound waves used to collect data in ultrasound scanning. 2. The transducer emits sound waves that pass easily through metal, but as they pass some of the sound waves are reflected back at the transducer due to variations in the metal’s composition, density, temperature, etc. These reflected sound waves produce data that allow for a scan of the weld to be produced. Think along the lines of a dolphin or bat’s echolocation. 3. As the metals heat, merge, and ultimately cool, the image changes. This allows for a live image of the progress of the weld. In this case, think along the lines of how ultrasound machines are used to track the development of a baby in the womb. 4. A specially designed “Real-Time integrated Weld Analyzer,” takes the data and automatically interprets and analyzes it to determine the quality of the weld. The analyzer uses advanced algorithms to grade a weld as acceptable, marginal or unacceptable. This takes about 150 to 250 milliseconds on average. All this just to skip inspection day? Not quite. Although the primary benefits of real-time inspection are more frequent, less destructive inspections that don’t require halting production, there are a number of other bonuses. Chief among these extra benefits is real-time feedback, which can be fed back to welding robots, allowing the robots to know when they should stop production or progress to the next weld. In some cases faulty welds can even be corrected, rather than just detected. The system has also proven useful in determining when the welding environment has begun to deteriorate, including such occurrences as electrode cooling system failure or electrode wear. The system detects the symptoms of deterioration through the effects they have on the weld itself. By allowing problems to be detected and addressed before they become critical, optimum welding conditions can be maintained efficiently, avoiding batches of faulty welds or production line interruptions caused by parts breaking mid-weld. Yes it is, and with increasing production volumes and the constant introduction of new metals that can have unexpected effects on the quality of a weld, the manufacturing industry needs advancements like these to balance quality with efficiency and stay competitive. If you’re interested in non-destructive testing methods, including ultrasonic inspection, the AWS offers an online course on the science of non-destructive testing. We invite you to visit our Website at http://awo.aws.org for more information. If you’d like to read more about this new ultrasonic technology and its implementation in Chyrsler’s Windsor Assembly plant, you can read the case study titled “In-Line Inspection of Resistance Spot Welds for Sheet Metal Assembly,” in the January 2014 issue of the Welding Journal, free with your American Welding Society membership.